The Cube Planters from Satu Bumi’s Standard Range of GRC Planters & Bowls are sturdy, well finished and competitively priced. 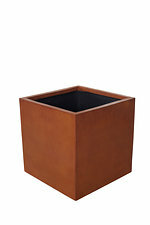 The Cube Planters come in four sizes with a variety of nesting options. Each planter is available in both raw concrete and a number of different old metallic and old stone oxide colours that provide a traditional and appealing aged appearance. In addition, quality paint finishes are also available in virtually any colour. This product is normally packed in wood. However, depending on volume, cardboard packaging can be provided upon request. Satu Bumi manufactures high quality precast GRC (Glassfibre Reinforced Concrete) landscaping products such as planters, pots, garden furniture and water features.